Steve Robinson - Author: What a couple of weeks! 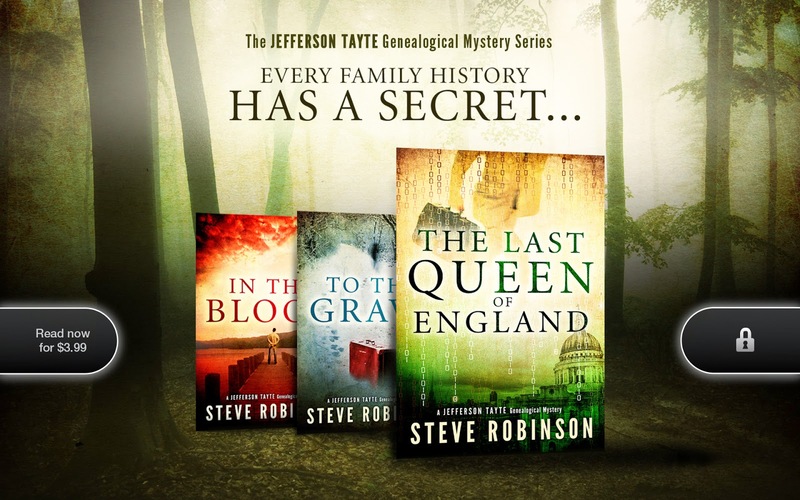 The 18th of March saw the Thomas & Mercer editions of the first three books in my genealogical mystery series go live on Amazon for the Kindle, and in paperback and audio formats, and it's been very exciting! I took a week off with Mrs R during launch week and we went into London to celebrate on the big day, and somehow I managed to resist checking my chart positions. When we arrived home I ran straight to my laptop though and had a look. I didn't know what to expect. I knew the advertising campaign in the UK wasn't going to start until the 4th of April, but I'd been told it would kick in straight away on Amazon.com. When I looked however, nothing much had changed. My books were live, but their chart positions had only seen a small increase. They were certainly up on the day before, but not significantly so. This was the case for a few days, and I thought, 'Steady progress... That's okay.' Then BAM! towards the end of launch week I was at a hotel in the Cotswolds, having a drink before dinner, and I checked my chart positions on my phone. Then I knew something significant had happened. In the Blood had shot up into the 200s over all, and by morning it was an Amazon.com top 100 bestseller! I was also very pleased to see that To the Grave and The Last Queen of England weren't far behind it. My books have been Amazon top 100 bestsellers before, but with the marketing that put them there being short and sweet, so was the time my books remained in the top 100. This time though, In the Blood has stayed in the top 100 for a week so far, having reached a high (that I saw) of No.48 in the Kindle store. The day after I arrived home from the Cotswolds, I found out what had happened. I had received an email from a fan who had already written to me some time ago, and he told me that my books were being advertised directly on his Kindle! Then Amazon confirmed it and sent me some screen shots, along with a few images of the on-site advertising they were running. Kindle device advertising. I love the atmospheric woodland setting. Where I'm at with the The Lost Empress. You might have noticed that I changed my blog header (and website) recently to coincide with the re-release of my books. 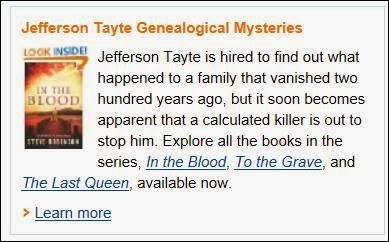 You might also have noticed that I've sneaked the title of my new Jefferson Tayte mystery in there. I'm currently going through a structural edit phase with the new book, which is designed to help shape the story and make it the best it can be. Early signs from my editors are very encouraging. This part of the process will last a few more weeks, and then the manuscript will be sent off for copyediting before the proofreading stage. We've not started on the cover design yet, and I can't wait to see how that's going to turn out. I've some strong ideas for it, and I already know the team behind its creation are going to do a great job. I'm going to be in a mini documentary - oh my! A film crew are coming to my house early next month (must tidy up!) and they're going to spend the whole day with me! I know... I still can't believe it, either. I'll tell you how it went next time, but suffice it to say I'm pretty nervous about it all. I usually run a mile from this kind of thing, but I've decided to get out there more (come what may) when the opportunities arise. Something tells me I'd better hide my guitars though before the film crew turn up! As an amateur geneologist, I love your books!! I received an email from Amazon about your books going to Kindle. So I scarfed them up and am waiting for The Lost Empress!! I had just finished all of Lee Childs 'Jack Reacher' series and was looking for another similarly entertaining author who could create a main character I truly liked. Found a few to try, then shut the cover on my Kindle Fire. When next I opened the cover, there you were! I have to admit that the artwork and titles immediately caught my attention. I immediately downloaded In the Blood, and have just finished reading it - very good writing! It's hard to keep straight all the myriad details involved with ancestry, so well done. I can't wait to start To the Grave. Really enjoyed the tour through Cornwall; just might have to pencil in a weekend trip!